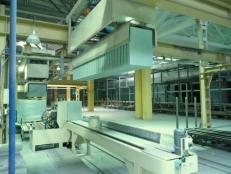 Complete plaster tile production unit. The entire range of equipment invented and developed by Messrs BERGOUNHON and their team. "Mastery and technical know-how, the GYPSOTONNE advantages at the service of our clients in order to meet their preferences and their requirements". 5- Tile wagon transfer system. 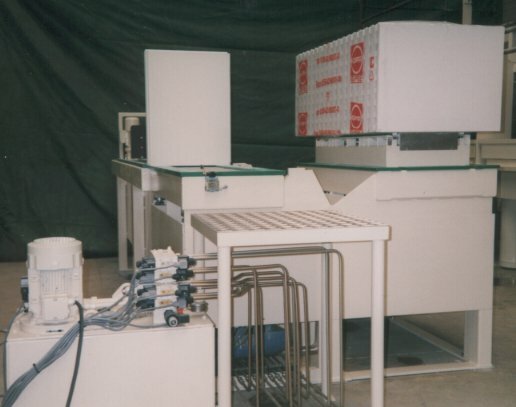 6- Palletisation and wrapping station. The plaster is weighed using scales mounted on spring balances. The water is also weighed in a tank. 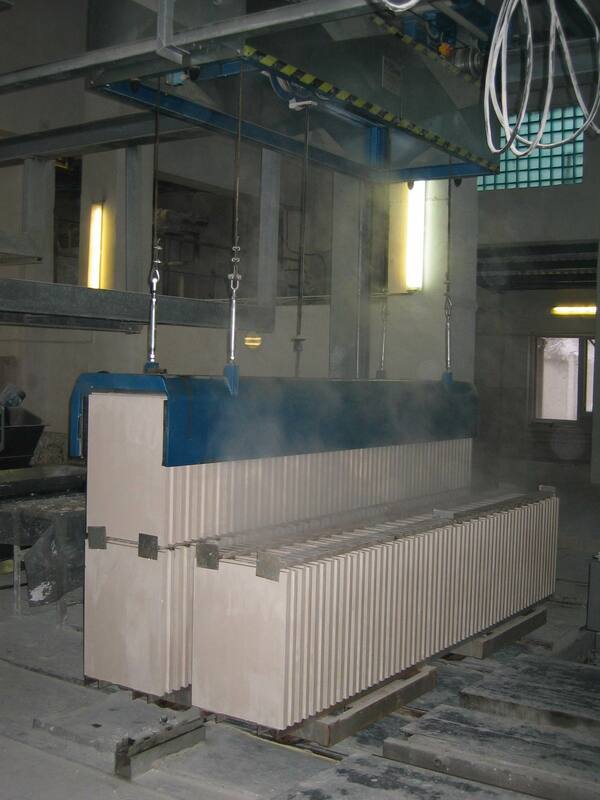 The water is poured into a hydraulically hinged tank and then mixed with the plaster after it has been weighed. One or two electric stirrers are used to blend the mixture. 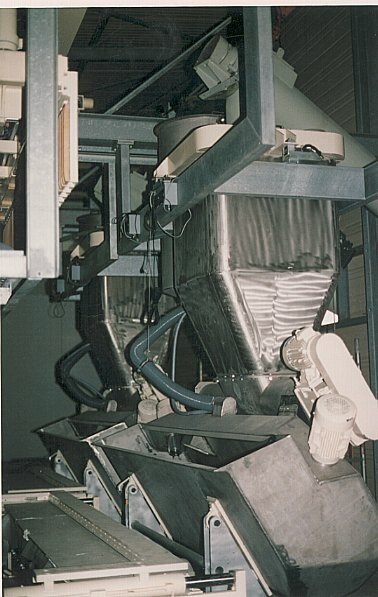 After a few minutes’ mixing, le gâchoir pivots to pour the water-plaster mixture into the machine à carreaux. 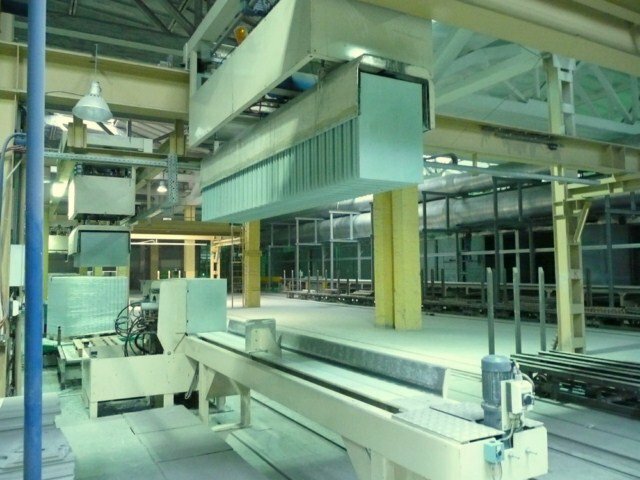 Once the moulding head had been filled, the product hardens as the plaster sets resulting in better tile moulding than that produced by an hydraulic robot. The tiles are then extruded out of the moulding head. 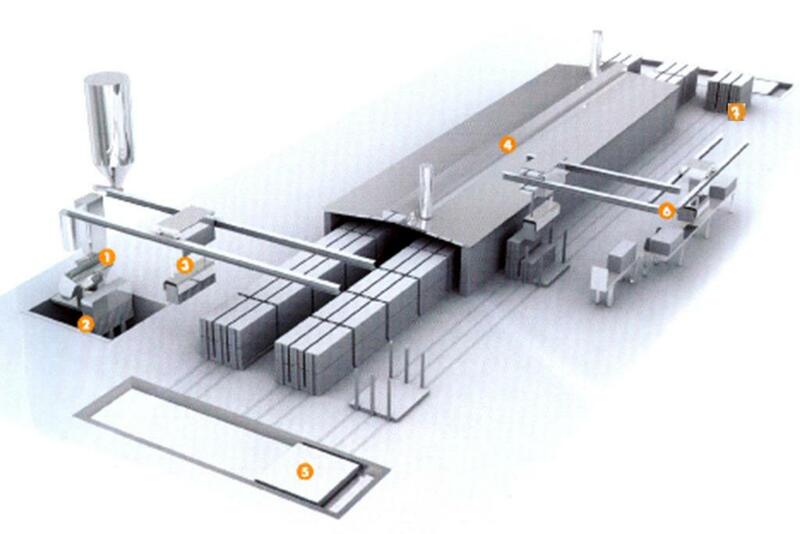 The entire cycle is automated, resulting in an average rate of 6 cycles per hour. 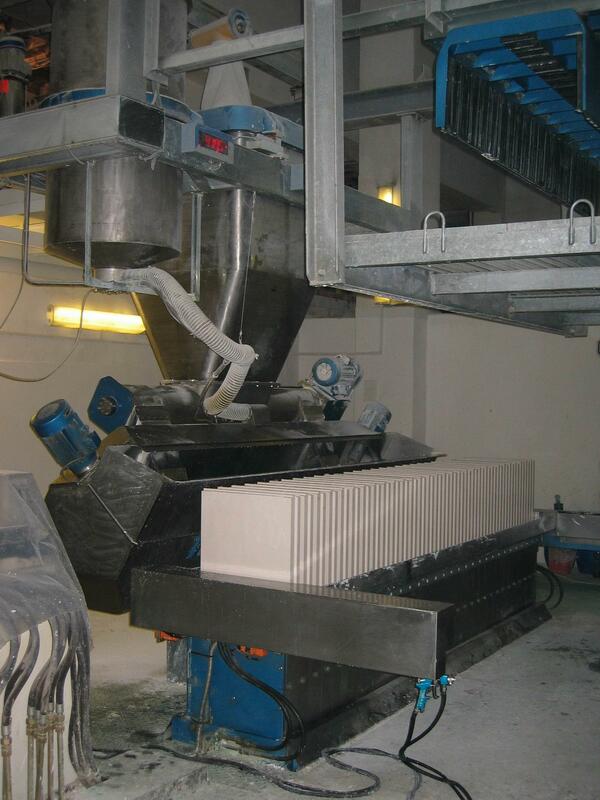 A grab with its overhead gantry collects the extruded tiles and placed them on the empty drying wagons. 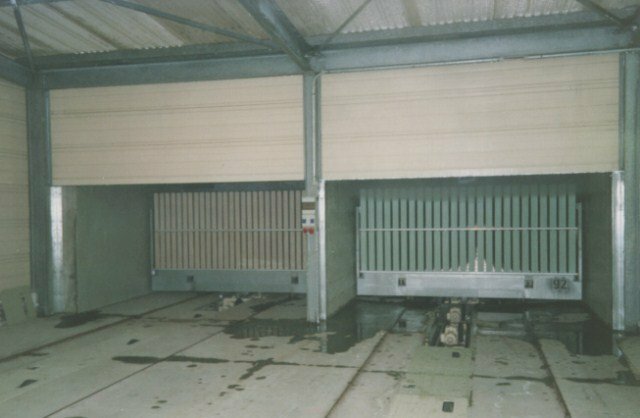 The drying wagons are then collected and pushed into the dryer by a hydraulic pusher at a rate set by the programmable logic controller. 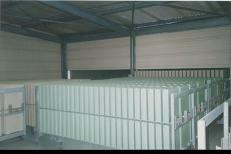 The products are dried in a crossways or lengthwaysséchoir tunnel. 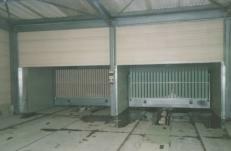 Les carreaux Are dried in contact with the hot air delivered by the sweeping fans positioned in line with and upstream from the gas burners. The air thus heated sweeps across the plaster tiles. An extractor fan in the dryer roof delivers the damp air to the outside, thus ensuring that humidity inside the dryer can be controlled. The conventional GYPSOTONNE dryer uses approximately 800 kca l/kg water. 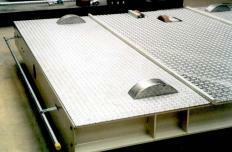 The GYPSOTONNE condenser dryer uses approximately 500 kca l/kg water. 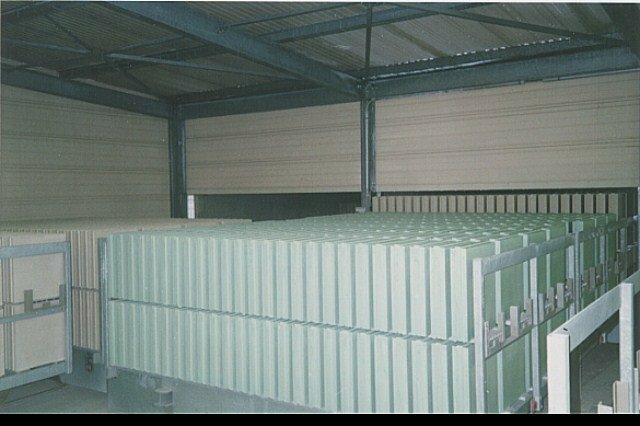 The dry tiles, still on the wagons, travel along the return track via an electric transfer mechanism. As they travel along the return track, the tiles are collected by a grab for palletisation. A carriage then moves the empty wagons to a transfer system at the entrance to the dryer. This transfer system then places the empty wagon on the dryer track identified by the programmable logic controller. 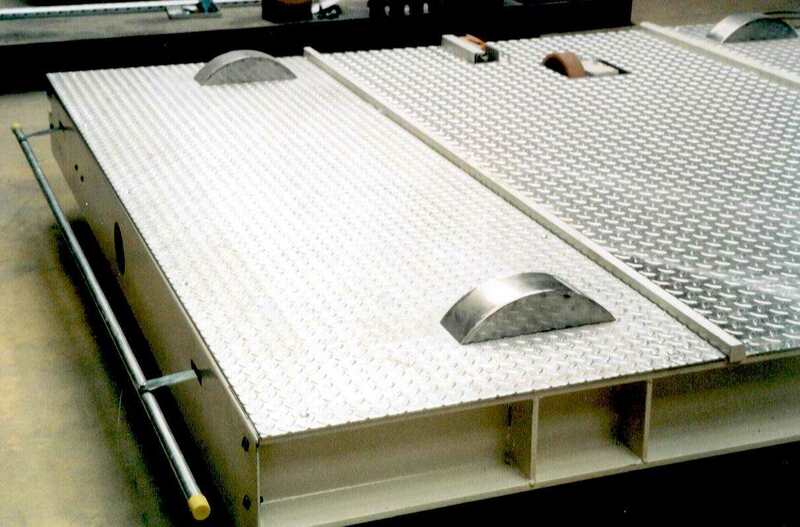 The unstacking grab and its overhead gantry, places the products on a bench where the tiles are pushed up against each other. This bench has a hinged end so that all the tiles can be tipped sideways. The heat shrink wrapping is fitted and shrunk manually on the table using a butane gas gun. 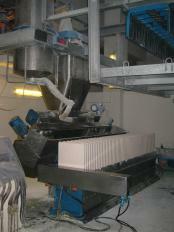 The handling grab with its overhead gantry then picks up the pack of wrapped tiles and places them on a pallet.